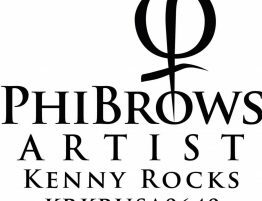 So if you’re tired of using a pencil, powder, gel, or wax to shape and define your brows, microblading at AK Lounge is a much more efficient way to get lovely brows without the daily maintenance. The entire process doesn’t take more than a few hours, and you’ll end up with impressive 3D brows. 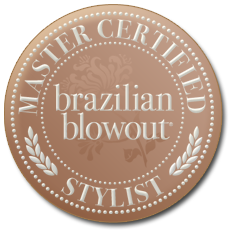 This means you’ll hardly notice a difference between your natural hair and the tattooed strokes, giving you ultimate coverage in areas where thinning or hair loss is present. Before your appointment, though, it’s important to keep away from blood thinners (such as aspirin) and alcohol at least one week prior. During the treatment, you’ll be given a numbing cream to help ease some of the discomfort. When you book with AK Lounge, we’ll do our best to make your experience as painless as possible. Just sit back and let us take care of the rest. You’ll be on your way to having shapely and defined brows in no time. 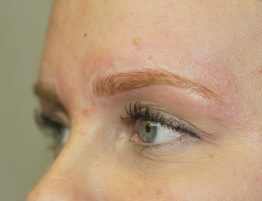 Consider the following aftercare tips to make the most of your microblading experience. Keep your brows away from moisture as often as possible. We suggest postponing activities such as exercising, washing your face (and getting it wet during a shower), swimming, or going to a sauna for at least a week following your appointment. Avoid wearing makeup or applying lotion to your face (not including any healing creams recommended by your technician). Avoid laser treatments, chemical peelings, tanning, extreme exposure to the sun, or any other activities that could burn and damage your skin. You may experience some slight swelling, redness, or itchiness during the first week, which is completely normal and expected following your procedure. You’ll want to apply Vaseline to the affected areas to help with the healing process. As with regular tattoos, the pigment color will appear darker at first and then gradually fade over time. However, you can come in for a quick touch-up once every six months to a year to keep your color looking vibrant and healthy. Say bye to thin and lifeless brows forever when you choose microblading at AK Lounge. Stop by our salon for expert care and service today! 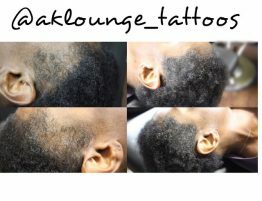 Scalp Micropigmentation — It Really Works! AK Lounge Is On The Move!